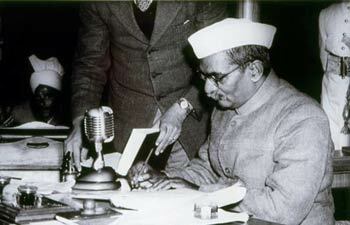 Rajendra Prasad was one of the architects of the Indian Republic, having drafted its first constitution and serving as the first president of independent India. Prasad is the only president in India to have been elected twice for the post. During the independence movement, he left his law work and joined the Congress Party, playing a prominent role in the Indian Independence Movement. He served as the president of the Constituent Assembly that drafted the first constitution of the Republic, which lasted from 1948 to 1950. He also became the first Minister of Food and Agriculture in the year 1946 in the Interim national Government. Rajendra Prasad was born and brought up in Siwan, Bihar in East India. He was the youngest son of Mahadev Sahai, and born in a Kayastha family. He was known as 'Rajen' to his family and friends. His father was a scholar of both the Persian and Sanskrit languages, while his mother, Kamleshwari Devi, was a religious woman. When Prasad was five years old, his parents placed him under the tutelage of a Moulavi, an accomplished Muslim scholar, to learn the Persian language, Hindi and arithmetic. After the completion of traditional elementary education, Prasad was sent to the Chapra District School and at a small age of 12, he was married to Rajavanshi Devi. He, along with his elder brother Mahendra Prasad, then went to study at T.K. Ghosh's Academy in Patna for a period of two years.He secured first in the entrance examination to the University of Calcutta and was awarded Rs.30 per month as a scholarship. He joined the Presidency College, Kolkata in 1902, initially as a science student. He passed Intermediate level classes then called as F. A. under the University of Calcutta in March 1904. Later he decided to focus on the arts and did his M.A. in Economics with first division from the University of Calcutta in December 1907. There he lived with his brother in the Eden Hindu Hostel. A devoted student as well as a public activist, he was an active member of The Dawn Society. It was due to his sense of duty towards his family and education that he refused to join Servants of India Society. Prasad was instrumental in the formation of the Bihari Students Conference in 1906 in the hall of the Patna College.It was the first organization of its kind in India and produced some of the eminent leaders of Bihar like Dr. Anugrah Narayan Sinha and Sri Krishna Sinha.